A body found in a river has been formally identified as the multi-millionaire farmer who has been missing for more than eight months. 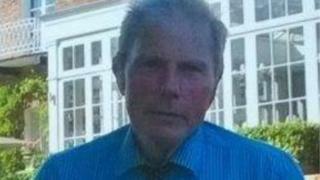 William "Bill" Taylor was last seen at home at Gosmore, near Hitchin, Hertfordshire, on 3 June. His body was found in the River Hiz, near Charlton Road, by a member of the public on 10 February. Mr Taylor's estranged wife Angela, 52, and her partner, Paul Cannon, 53, have pleaded not guilty to his murder. The farmer was last seen at his home, Harkness Hall, at about 21:00 BST, shortly before his 70th birthday. He was reported missing the next day and police, sniffer dogs and a helicopter were used to search the countryside around the farm. Since he was reported missing, three people have been charged in connection with his murder. Ms Taylor, of Charlton Road, Hitchin, and Mr Cannon, of Pirton Road, Hitchin, have also denied an arson attack on Mr Taylor's car days before he disappeared. Last month, Gwyn Griffiths, 59, of Lucy Avenue, Folkestone, Kent, was charged with conspiracy to murder and assisting offenders. He is due to appear at the same court next month.